"Try our most ordered box for the ultimate indulgence. 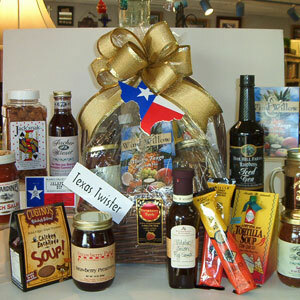 Contains Honey Pecan Butter, Robert Rothschild Pita Chips, Salsas, Jalapeno Dip Mix from Dripping Springs, For Tea's Sake Gourmet Tea & Tea ball, Cheeseball Mix, Strawberry Preserves, Tortilla Soup Mix, Texas Chili & Gumbo Mix, Roasted Raspberry Chipotle Sauce, and a selected Strawberry Patch sauce." Shipping costs are added to the total price once the weight and destination of the package are determined. Actual costs may very be depending on destination and size. Packages with shipping costs under $20 are added to the total cost and shipped right away. If total shipping costs exceed $20, we will contact you for permission to ship. If you would like to know the exact cost of shipping prior to purchase, or if you are looking for special rates for volume purchases, just give us a call at 800-270-7984 and one of our staff will be happy to help you. Select Either a Gift Box or a Gift Basket.